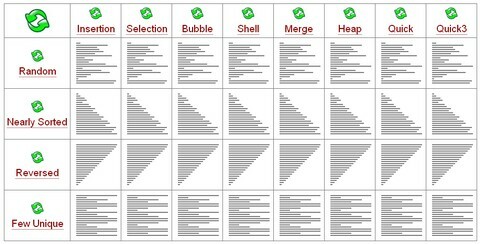 Sorting Algorithm Animations show 8 different sorting algorithms (Insertion, Selection, Bubble, Shell, Merge, Heap, Quick and Quick3) on 4 different initial conditions (Random, Nearly Sorted, Reversed and Few Unique). These visualizations are intended to show how each algorithm operates and the advantages and disadvantages of each of them. It has concluded that there is no best sorting algorithm.The worse-case asymptotic behavior is not the deciding factor in choosing an algorithm. And also, the initial condition affects performance as much as the algorithm choice. I saw this a while ago, very cool. Thanks for posting! I’ve been meaning to look for it again.